How much water should an athlete drink during exercise? Is thirst an accurate predictor of hydration needs? While much of the report focuses on daily fluid requirements for the public, ACSM’s experts note that thirst is not the best indicator of how much these individuals should replace in terms of fluid and sodium losses following prolonged physical activity and/or heat exposure. Fluids before, during and after exercise are an important part of regulating body temperature and replacing body fluids lost through sweat. Dehydration resulting from the failure to adequately replace fluids during exercise can lead to impaired heat dissipation, which can elevate body core temperature and increase strain on the cardiovascular system. Dehydration is a potential threat to all athletes, especially those who are not acclimatized for strenuous activity in hot environments. To minimize the potential for heat exhaustion and other forms of heat illness, Kenney and other ACSM experts recommend water losses due to sweating during exercise be replaced at a rate close to or equal to the sweating rate. This can be accomplished by athletes weighing themselves before and after the exercise bout. This recommendation is based on sound scientific data and clinical experience dealing with athletes suffering from heat-related illness. The report also makes mention of active people avoiding excessive fluid consumption which may, in the extreme, result in hyponatremia. While hyponatremia is a rare occurrence, it is a dangerous condition that may arise when athletes drink too much water, diluting the body’s sodium levels. It is most often seen in prolonged endurance athletes, such as those participating in marathons and triathlons. ACSM's current hydration guidelines address this threat in addition to the more commonly occurring dehydration problem and provide recommendations that can help prevent both health hazards for the athlete. Generally, persons participating in prolonged or strenuous physical activity (including both exercise and occupational settings) should continue to heed current hydration guidelines. Water and sports drinks are not dangerous to athletes when consumed as recommended – in volumes approximating sweat losses. Water, in particular, quenches the sensation of thirst before body fluid replacement is achieved, so thirst should not be the only determinant of how much fluid is consumed under such conditions. 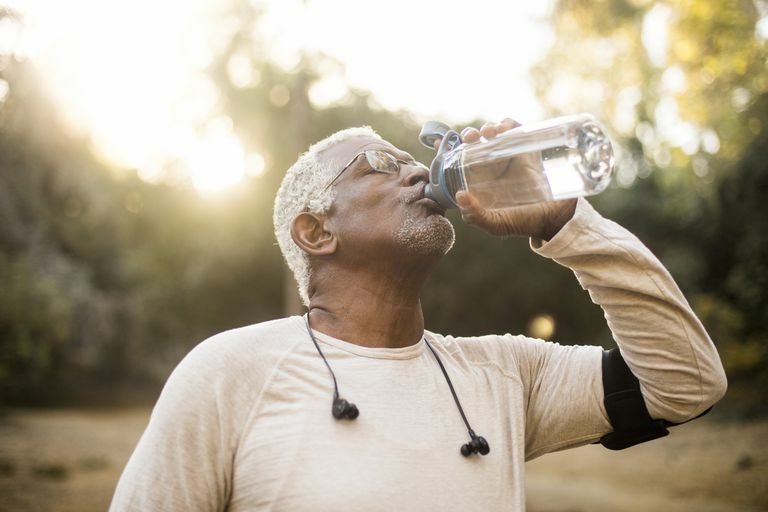 "Relying on thirst to determine an active individual’s fluid replacement needs is inadequate, especially so in older exercisers. As we age, thirst becomes an even poorer indicator of the body’s fluid needs,” said Kenney. In a similar vein, the IOM report's guidance on chronic sodium intake should not be confused with recommendations that athletes liberally salt their food and consume sports drinks when acclimatizing to, or exercising in, hot conditions. While cutting back on overall sodium in the diet is sound advice for the majority of the public, athletes have a special need to replenish lost sodium stores in the short-term. ACSM's Position Stand, Exercise and Fluid Replacement, is the fourth official statement addressing fluid replacement guidelines and recommendations for fluid ingestion and the prevention of heat injury during exercise.